Please join us at Penrith Regional gallery and Lewers Bequest on Friday September 20th between 5 and 6pm for the opening of In Conversation, an exhibition of works by Advanced Diploma of Visual Arts students. Students were asked to develop their works in response to the works of David Hockney, currently on display in the gallery in the small exhibition 'Love David'. 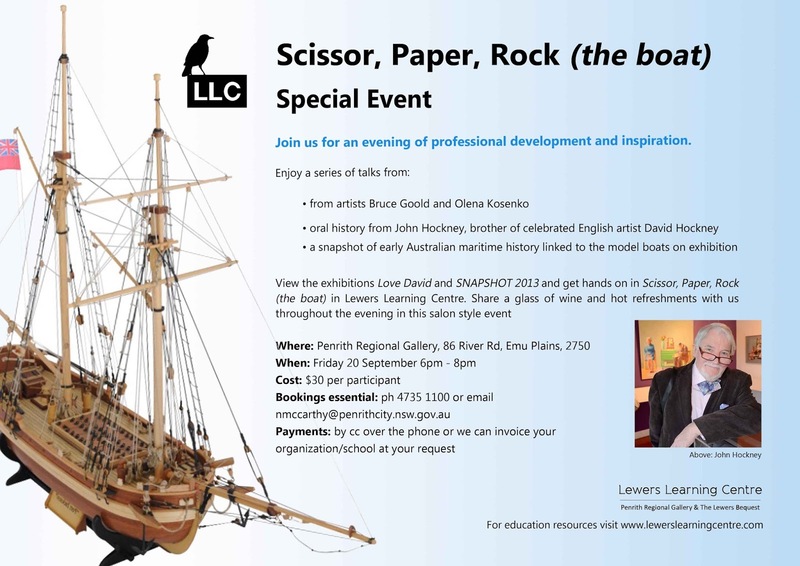 The exhibition will be opened by Hania Radvan, CEO of Penrith Performing and Visual Arts, and will continue until November10th. Guests at the opening will also have an opportunity to stay at the gallery for Rock-Scissors-Boat special event (see details below) for a special price of $10. We look forward to seeing you there! Journeys II Opens on Wednesday!